In a world gripped by organized crime, family dysfunction, and dim hopes of redemption, can true love persevere? For Sophie Taylor, a beautiful psychologist who lost everything when she violated an ethical boundary, and Grant Madsen, a handsome naval officer who sacrificed everything to protect a loved one, finding that love may carry an unbearable cost. Starting their lives over in Chicago, both are fighting influences from their family and running as fast as they can to escape the past. When their paths cross outside the parole officer's door, the attraction is instantaneous. But a hidden connection may not only shatter their fledgling love, but prove deadly to them both. This is definitely a unique novel. The author is obviously brilliant, because nobody but a genius could come up with a plot this twisted and awesome! The plot is so interesting, I was instantly in love! The idea or making two ex-convicts meet and fall in love outside their Parole Officer's door is priceless. 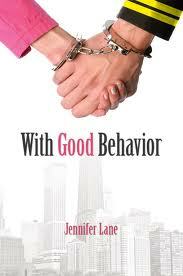 In all my years of being a die hard romance novel addict, I have never read anything like With Good Behavior. I love how dynamic and animated the story seems. The imagery is so vivid, the way she uses literary devices so descriptive, it feels as if I'm apart of the novel. It's very gripping. It pulls you in and won't let go. I love how Grant and Sophie seem so real, unlike a lot of characters in romance. Jennifer created characters who have made plenty of mistakes, and have feelings. I can't tell you how many times I have read a book about a couple falling in love and the guy is this perfect man who would never burst in to tears when someone dies or something bad happens, and you can tell hes fake. But not Grant. Even if he seems embarrassed to cry in front of people, it makes the story more believable when the characters show feelings. There's so much irony in With Good Behavior that I never wanted to put the book down. I kept waiting and waiting how everything would play out, and it just got better! There was so much in the book that made me laugh out loud. Heck, I couldn't wait to get to the next chapter to see what funny new chapter title was next. Between laughing (mostly laughing) and crying (there was plenty of tragedy), I was hooked, right from the start. Actually, I was probably hooked from the book cover;It's very engrossing. One of my favorite aspects of this novel it when the characters are thinking or talking about there pasts, Jennifer wrote out the scenes. It helps the reader to get a clearer picture of what happened to the character in more detail. It is very obvious how much work Jennifer put into the creation of this novel. I was so impressed with the way she took her time with research; it's easy to tell she didn't rush through to be done with it. With Good Behavior is a complex work of fiction. All her characters intertwined, it was interesting (yet nerve-raking) to watch it all unfold. Everyone! Adventure lovers, suspense, romance fans! I think anyone could be interested in reading With Good Behavior. I loved it, and I'm sure you will too. It was rather long though, so if your in the mood for a novella, don't look for this book. But, other than that, dig in!